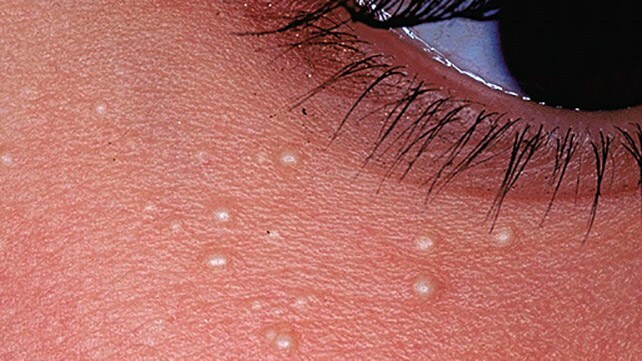 Are you one of those few people who have these tiny, milky spots in some of your nose and cheek regions? If you're thinking they're white heads, you are wrong. Milia, also known as 'baby acne', are commonly found on the skin of people of all ages. They are formed when keratin, a strong protein found in skin tissues and hair, becomes entrapped beneath the outer layer of the skin, forming a tiny cyst. Milia are so common in newborn babies but there are people who could develop this condition at a later time. They have been linked to sun exposure, burns, blistering, and use of steroid creams. Although, they’re not itchy or painful, they mighty cause discomfort for some people. Check out these awesome remedies you could perform at home to get rid of these pesky bumps. Mix together 2 Tbsp. of sugar along with half a lemon’s worth of juice, and 1 tsp. of oil. Just apply the mixture to your face, and let it sit for 20-30 minutes. Lemons have amazing antioxidants and healing properties, making them a go-to solution. Honey attracts moisture to the skin, which helps exfoliate the outer layer thus causing new skin growth. Try mixing it with sugar for added effect. Though castor oil has long been known to treat conditions like constipation, asthma, and bladder infections, it is also great for skin. Mix it with equal parts of olive oil and apply to your face. Wait for it to soak in, then dry off. Steam is one of the best ways to rid yourself of skin impurities. The steam helps open pores in the skin, and get rid of any gunk that might be hiding underneath those layers. Combine the cornstarch and vinegar to make an astringent paste, and place it on your face. Leave it on for about 25 minutes, then rinse off. - Remove makeup before bed to avoid impurities to stay overnight. - If you have sensitive skin, keeping cool from the sun is a good idea because harmful rays can damage your skin.